The ranch is located 4 miles west of North Powder, Oregon. The ranch headquarters is a short distance from the North Powder Lane (a paved county road). The homes all have beautiful views of the Anthony Lakes area and the Eagle Cap Wilderness. The ranch headquarters consist of 4 homes. The owners’ custom 2368 sf, 3 bedroom, 2 ½ bath home with double car garage was built in 2008. The other 3 homes range in sf from 2239 to 1458 sf on the main floors and all have basements. All three homes have updated heating systems and have been updated as needed. There is a 19,000 sf Coverall arena that is used for branding and allows the owner to never be rained out for brandings. There are several machine storage buildings located on the property as well as shop and horse barn. The ranch has a working set of corrals, hydraulic chute and electric scales. The ranch consists of 3280 acres m/l with 1363 acres covered by water rights. There is 415 acre feet of storage water available from Piltcher Creek Resevior that service the ranch via the North Powder River. There are four pivots on the property that cover 254 acres m/l. The balance of the irrigated ground is by flooding through earthen ditches. Full listing of water rights is available on request. There are two irrigation wells on the property that service the pivots and an additional 2 well permits are available for additional ground. The water cost for the storage water is usually about $20.00 per acre foot. The flood water is free other than a small fee for ditch maintenance and ditch rider. 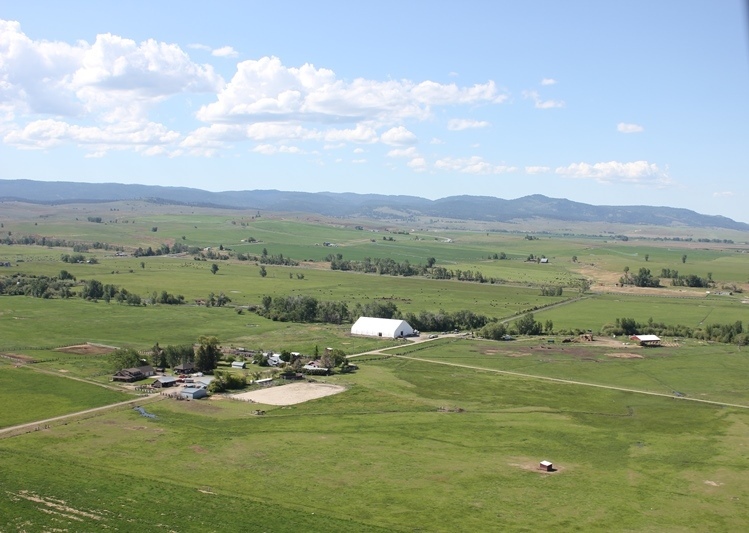 There is an additional pasture grazing lease for 275 AU on 5102 acres and private lease on 119 acres irrigated pasture also available to the ranch. The property is EFU, Exclusive Farm Use. The permitted uses in this zone are livestock ranching, farming field crops, product sales in relation with agriculture uses and single family homes. Parcels may be divided to 160 acres if full primary water rights exist. The minimum parcel size increases to 320 for land with no water rights. The primary soils are Baker silt loam (11A), Cumulic loam (40A), Haines silt loam (62A), Veazie-Voats loam (66), Wingville silt loam (176A), Umapine silt loam (170A), Stanflow-Umapine silt loam (159A) and North Powder loam (114C) . The hay meadows and better pasture are Baker silt loam, Cumulic loam, Veazie-Voats loam and Wingville silt loam. The Baker silt loam is a deep, well drained soil on low terraces. The surface layer is a very dark brown silt loam about 8" thick, the upper subsoil is a dark brown silt loam approximately 8" thick, the upper subsoil is a dark brown silt loam approximately 8" thickm, the lower subsoil is a brown loam about 15: thick. The substratum is gravelly sand to a depth of 60" or more. Capaility is IIIs under irrigated conditions. The Cumulic loam and Veazie-Voats loams are deep to moderately deep well drained soils on the bottomlands and low stream terraces. The surface layer is a very dark brown loam about 11" thick, the subsoil is a dark grayish brown loam approximately 21" thick. The substratum is gravelly sand to a depth of 60" or more. Wingville silt loam (176A) is a deep, somewhat poorly drained soil on the terraces and bottomlands. The surface layer is a black silt loam about 23" thick, the subsoil is a mottled brown silt loam approximately 17" thick. The substratum is silty clay loam to a depth of 60" or more, capability is IIIw, irrigated and non-irrigated. These soils are good producers and are well suited to row crops, field crops, grass pasture and hay. The lower quality pasture is a combination of Haines silt loam, Umapine silt loam and Stanflow-Umapine silt loam. Umapine silt loam is a deep, somewhat poorly drained soil, occurring on low terraces. The surface layer is a brownish silt loam about 7" thick, with an underlying layer of grayish brown/brown silt loam to 60" or more. PH and salinity are very high in areas; capability rating is IIIw. Haines silt loam is a deep, poorly drained soil on the floodplains and bottomlands. The surface layer is a dark grayish brown silt loam about 9" thick, the subsoil is a dark grayish brown mottled silt loam about 21" thick. The substratum is grayish brown silt loam and mottle sandy clay loam to a depth of 60" or more. Capability is not rated under irrigation.